With Justinmind, you can share UI libraries with other Justinmind users in just a few clicks. You must be logged into a Justinmind Enterprise account in order to make use of the Shared widgets functionality. Go to your custom widget library within the Widget library palette. Currently, this library can only be seen by you and is stored locally. To share it, click the gear icon at the top of your library in the Widget library palette and choose the “Share” option. In the dialog that appears, select a Justinmind online account to share your library to and click “Next”. You will be asked to confirm that you wish to upload all local changes to the account. Click “OK” to apply changes and upload your library to the account. With your custom library shared, you can keep working on it. To keep your library up-to-date, you can commit your changes so all Justinmind users with access to your library can see them. 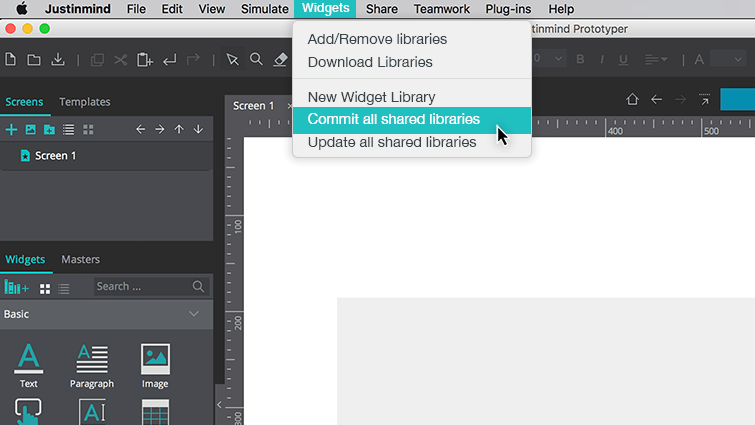 To do so, click the gear icon at the top of your Widget library and select “Commit” from the menu. A dialog will appear confirming that you want to commit all local changes to your library. Click “OK” to upload and commit all local changes. 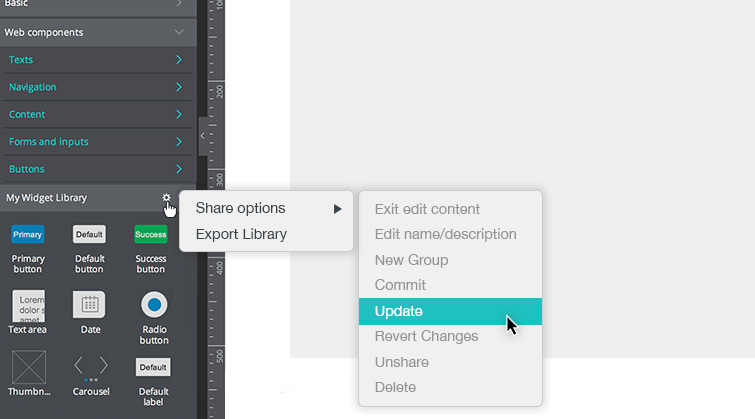 Note: if you have made changes to multiple shared widget libraries and would like to update them, click “Commit all shared libraries” from the “Widgets” main-menu option. As owner of a shared widget library, you will be able to perform all of the above operations. If you are a Justinmind user and another Justinmind user has shared a custom widget library with you, you will need to update your workspace to get access to the library. To do so, go to the “Widgets” main-menu option and select “Update all shared libraries”. Then, go back the “Widgets” main-menu option and this time select “Add/Remove libraries”. In the dialog that appears, go to the “My Libraries” tab. At the bottom of this tab you should find the newly-shared widget library. To start using it, click “Add to widgets” and close the dialog. Go to the Widget library palette. Your newly-added library should appear at the bottom of the list. 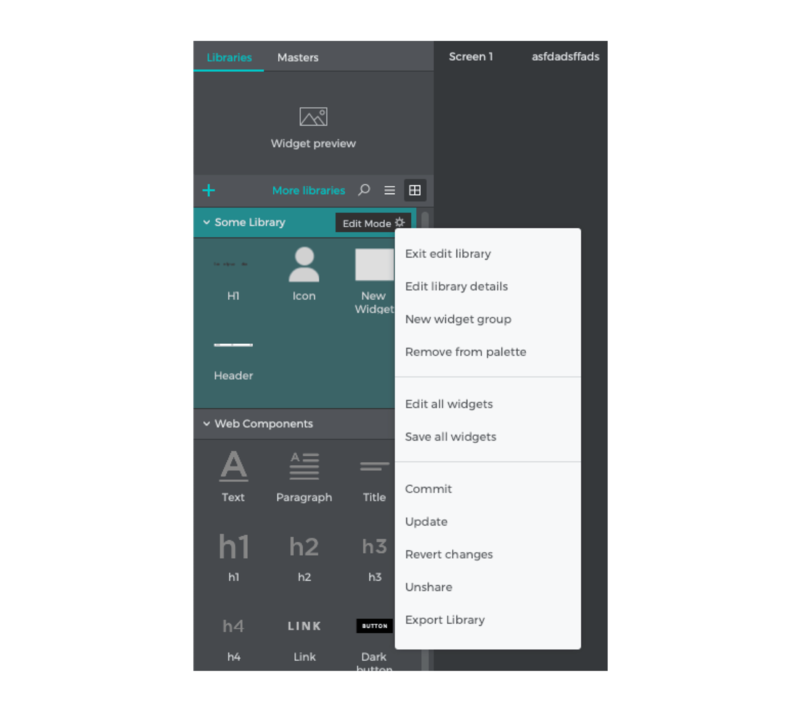 To check if the Library owner has made changes to the shared widget library you are working with, click the gear icon at the top of your Widget library and select “Update” from the menu.